Comparison of my wire (aftermarket Dunlop India) and Rostyle (presumed original) wheels. The outer face is the closest comparison between the two, giving a (near) standard clearance to the outer arch, which has the effect of reducing the track with the wider Rostyles. If choosing wider wheels you would have to go for more offset to maintain that clearance, while still giving adequate clearance to the inner part of the wheel well. Note the face of the drum of the Rostyle is to the right of the drum on the wire wheel denoting the extra length of the stud-wheel axle. This has the effect of putting the outer edges of both types of wheel close together i.e. giving the maximum rear track within the arches. 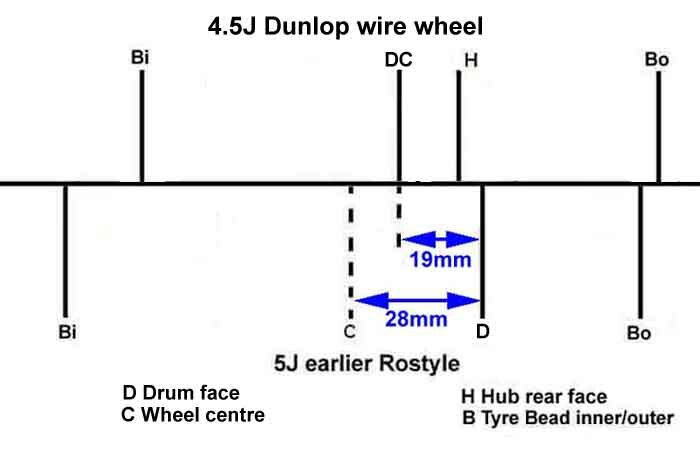 The Workshop Manual gives an identical track for both the roadster 4J disc (5J on the GT) and the 4.5J wire (roadster and GT) wheels, meaning that the different axle length was exactly balanced by the different offsets of the two wheels. Wheel and tyre width is irrelevant as the track is measured from the centre of each tyre/wheel. The front track was 1/4" bigger for wire wheels, indicating that the different hubs did not quite balance out the different offsets. Showing the protrusion of the 'hub cap' mounting face of the earlier narrow-track wheel. This makes the wheel 'wobble' when that side is laid down on a flat surface with the hub-cap removed. The later wide-track wheel with less offset lies flat with no wobble. Positive, zero and negative offsets, where the mounting face is outside the centre-line of the wheel. Positive offset is the usual arrangement - for steel and alloy wheels at least, to bring the angle of the kin-pin and the centre-line of the tyre together at the road surface. Negative offset is often used on show cars to bring the wheels out, but it causes them to move back and fore as the wheel is turned instead of pivoting and can adversely affect handling. Image from Crankshaft Coalition. This means there is a mathematical relationship between wheel width, offset and backspace, and it is much easier to measure backspacing and use the stated wheel width to calculate the offset, than measure the offset directly from some notional centre-point of the wheel. For positive offset wheels as on the MGB, take the backspace, subtract half the wheel width, and you have offset. Well, I say easier, but it is not quite so simple as that. 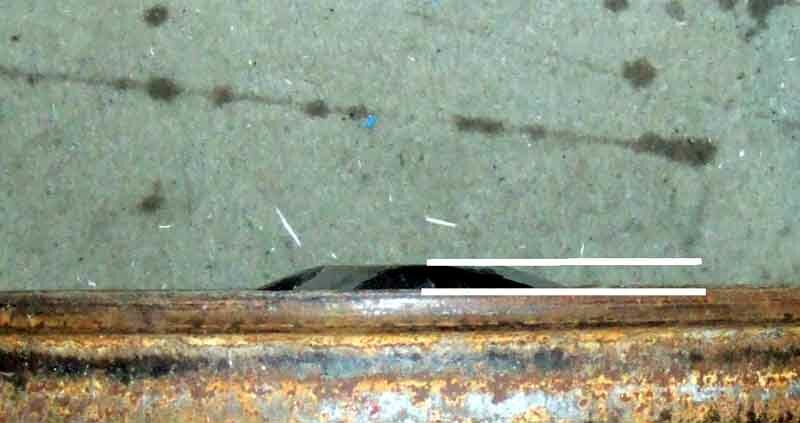 Some sources say to lay a straight-edge across the rim of the wheel and measure from there to the mounting face to get the backspace, and do the calculation. But the stated width of a wheel is the part that the beads sit in, i.e. excluding the outermost part of the rim, so one way or another you need to take that into account. The easiest way, especially if there is no tyre on the wheel, is to measure the overall width of the wheel i.e. rim to rim, then measure the backspace from the inner rim, subtract half the overall width from that, and you have offset directly. Some sites indicate you should subtract 1/2" from the backspace, but that would be if you are using the stated wheel width instead of the overall width. But half an inch is only an approximation - on both my V8 alloys and old Rostyles it is 0.55". Another complication if measuring existing wheels with tyres on. If you don't have a straight-edge that only sits on the rim and doesn't reach the tyre, you have to take into account the 'bulge' of the tyre past the rim. I laid a straight-edges across smooth parts of the tyre wall, and measured from there to the edge of the rim on each side to get two 'bulge' correction factors. Measured tyre bulge to tyre bulge and subtracted both correction factors to get an overall rim to rim width. Then I could do the original calculation for offset and got 28.5mm - close enough to the stated value of 28mm.